Immaculate Conception of the Blessed Virgin Mary Roman Catholic Church of York was established in 1852, and the pipe organ in the first church, which was dedicated in 1853, was built by the Pomplitz Organ Company of Baltimore, MD. We do not know the specifications of that first organ but from a newspaper article we know that a Professor Hermes gave a recital on the organ, spoke well of its tonal quality and said that "it decorated the church not a little”. 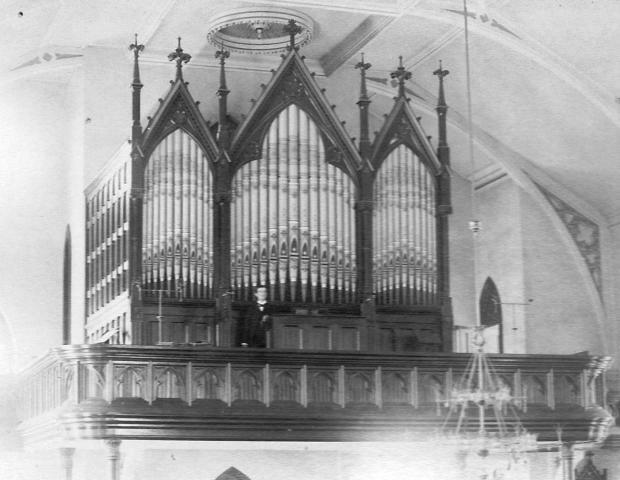 The present church was constructed in 1884 and a new organ was purchased for that church. The following news articles give an insight into the acquisition and installation of the new organ. The instrument itself was located in the room immediately above the center vestibule in the central bell tower. The console of that organ sat on a small balcony located just above the center vestibule doors. The large wooden supports for the balcony can be seen on either side of the door. That first installation proved to be something less than successful. Since all the pipes sat in the room above the vestibule, in the center bell tower, the sound was muffled and not at all what was expected of this large organ. The organ loft was extended and 4 pillars were required to support the new gallery. The entire organ was then moved out of the center bell tower and the wall opening that was the front of the organ was now closed up and became the back of the organ chamber. An enclosure was built by the Pomplitz Co to encase the organ in its new location. Between 1886 and 2009, several changes were made to the organ. The first major change came in the 1930's when the Gundling Co. of Lancaster converted the organ from it's mechanical tracker action to the electo-pneumatic action. A rupture in a steam pipe in the basement of the church in the 1970's caused the organ blower to pump the hot moist air into the windchests, ruining most of the leather in the windchest pneumatics. The chests were releathered and a new “English style” blower was installed in the room behind the organ. Also, at about this time, a family contributed funds to install chimes in the organ. By the turn of the new millennium, notes were beginning to either cypher (stick) or not sound at all. The parish council contacted several organ companies to request proposals to overhaul the organ. Several options were submitted from releathering those chests that were failing, completely redoing all the chests or a complete rebuilding and restructuring of the instrument. The parish council elected the third option and selected the proposal of the SDG Organ Company of Millersville, PA. Immediately after the 2008 Christmas season, SDG Organ Co. removed the entire organ with the exception of the front facade pipes and the 16 foot double open diapason rank. They also opened the back wall where initially the front of the 1885 organ sat so it was possible to look up to the choir loft and see thought the front pipes all the way to the stained glass window in the front of the center bell tower. When SDG Organ Co. reinstalled the organ, it was almost a completely new instrument. It went from 14 ranks to 21 ranks but remained in three divisions. The pipe sizes range from 16 feet to ¾ inch in speaking length. It has all four organ pipe families, flutes, diapasons, strings and reeds. It includes the chimes that were installed in the 1970's. The new swell chamber extends about 2 to 3 feet back nto the center bell tower. The basic organ specifications are listed below. NOTE: (*) rank includes all or some pipes from the previous organ.